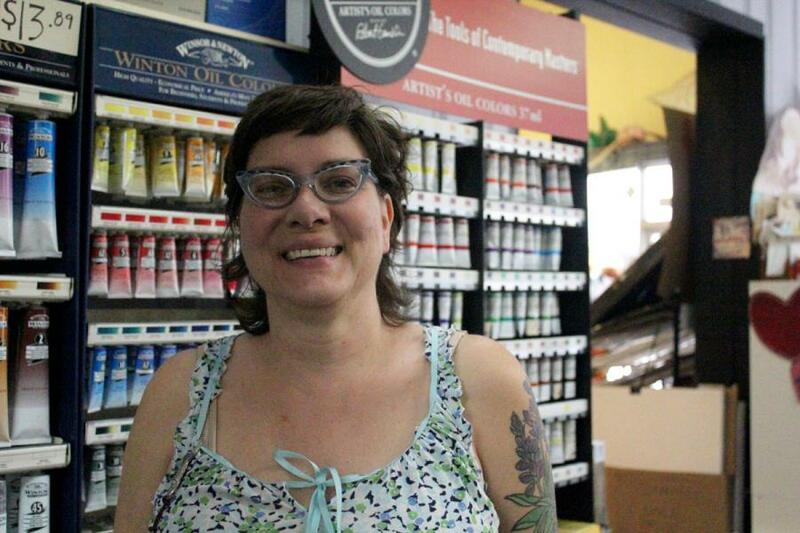 Omaha, NE — Peggy Gomez opened Gomez Art Supply in Lincoln in 2003. Gomez moved the store downtown in 2006. Business was pretty good. Every year, she saw sales grow by about ten percent. And it got even better in 2008. “In 2008, Blick, who was my biggest competitor in Lincoln, closed, so that changed my life. They closed in February and that spring I got new gutters on my house,” Gomez said. In 2011 Gomez bought additional space in her building on 14th and P Street. “I thought, well, my normal growth will cover the cost of the additional rent. That’s when the economy hit me. Most of my customers are students. And so when the economy affected the university and people weren’t taking as many classes that directly influenced me,” Gomez said. A lot of businesses across Nebraska saw their sales drop because of the recession. You can see it by looking at the state’s tax revenue. “In Nebraska for the general fund, the two largest sources of taxes are the state sales and use tax and the individual income tax,” said Kim Conroy, state tax commissioner. 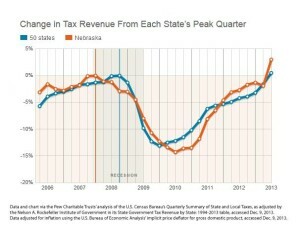 Nebraska’s gross tax revenue went up by 5 percent from 2006 to 2007. Conroy says that’s about what you would expect for a normal year. But in 2008, sales tax revenue grew less than 2 percent. And then in 2009, it fell almost 3 percent. You can see the same trend in Nebraska’s gross income tax revenue. According to Conroy, that’s not a coincidence. “During the recession, people weren’t making as much money. Weren’t taking as much home in their paychecks. And because of that they don’t have as much money to spend in the economy. That’s why people weren’t eating out, or people weren’t buying new clothes,” Conroy said. 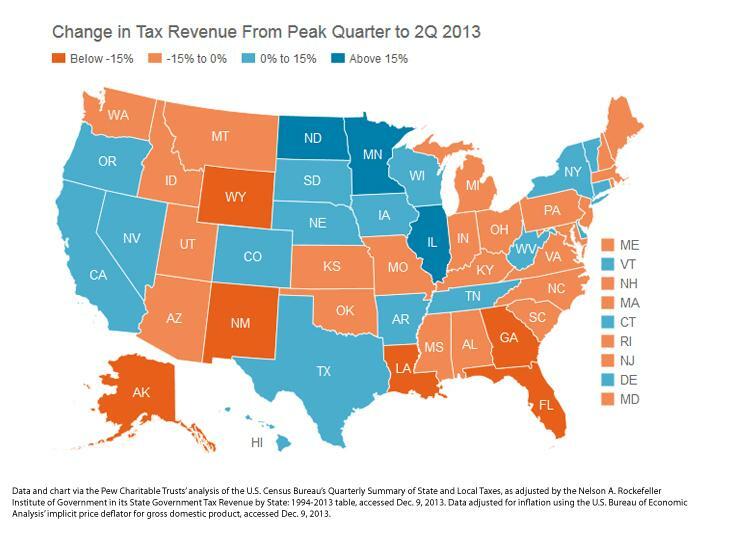 Tax revenue in the state has been climbing — slowly — since then. The Rockefeller Institute and the Pew Charitable Trust looked at every state’s quarterly tax revenue since 2006, adjusted for inflation, and found this is the first year Nebraska collected more tax revenue than it did at its peak in 2007, right before the recession. Conroy has worked in the tax commissioner’s office since 2008, so she’s been able to see the way the state’s tax revenue has fluctuated during and right after the recession. In 2010, the Business Cycle Dating Committee in Massachusetts, a group of people whose job is to put dates on periods of economic upswings and downturns, officially declared the recession ended in June 2009. That’s when the economy stopped falling and started to recover. But the recession — and recovery from it — hasn’t been the same for everyone. The Rockefeller and Pew report found only about half the states have returned to pre-recession levels since 2009. After adjusting for inflation, the report also found Nebraska collected the least tax revenue in the middle of 2010, more than a year after the official end of the recession. Peggy Gomez saw her sales drop after 2009. “I think in 2011 instead of growing any sort of percentages, I went down 2 percent. Which really hurts. Now I can feel it slowly getting better,” Gomez said. Sarah Gauger is one of the co-owners of OMT, a women’s resale clothing store in south Lincoln. She also felt the recession hardest a few years after 2009. Gauger used to run a bridal store alongside OMT, but she had to close it in 2011. “Both the internet sales and the recession were putting enough strain on us that we couldn’t support it anymore,” Gauger said. Gauger and Gomez have been trying to find ways to bring in new customers. Gauger and her co-owners rebranded the store from One More Time to OMT, remodeled the interior, and tried reaching out to customers through social media instead of traditional advertising. Gauger says it seems to be working. “When you’re waiting for people to come in the door and feel that positive attitude. It seems like it takes a really long time. 2013 was the first year I really felt like we were back,” Gauger said. 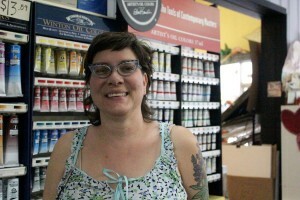 Gomez is also trying to attract new customers to her art supply store, especially non-students. She’s not sure what’s working, but she is seeing more customers relax a little bit about their spending. “I think people are starting to just paint more and make more things, just feel like they have a little bit of extra income to go out and buy some things,” Gomez said. But she doesn’t think her business will ever be the same as it was before the recession. “I don’t think those days will ever come back again. I really don’t. I wish they would! It just, you know, it just levels out to some place different,” Gomez said. 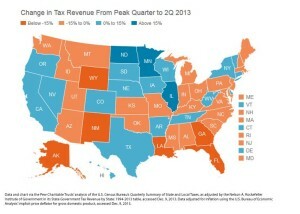 Economic indicators, like tax revenue, show the economy is improving. Between 2012 and 2013, Nebraska’s total gross tax revenue grew by 7 percent. But it’s hard to tell if the economy will be the same as it was before the recession. Gauger and Gomez and a lot of business owners in Nebraska are still adjusting to the new normal of life after the recession. Correction, 5/29/14: The original version of this story referred to the “Pew Research Center” as the author of the tax revenue report. The correct author of that report is the Pew Charitable Trust.